Now if feels like we are reaching to the true north of Sweden. After leaving Molkom after a rain delay, we decided to put on some serious kilometers. Our intial plan was to spend the night in Mora, but after a early dinner picnic along Lake Siljan, we got back on the bikes and continued north on E45. Once we were too tired to go on, we stopped in the small town of Sveg and set up camp for the night. With no windshields on the bikes, we get really tired out after about 200 km. Here in Sveg Davey met some Estonia guys and they fished in the river late into the night. Out next goal is to make it 400 km to Vilhelmina, then Jokkmokk the next night. 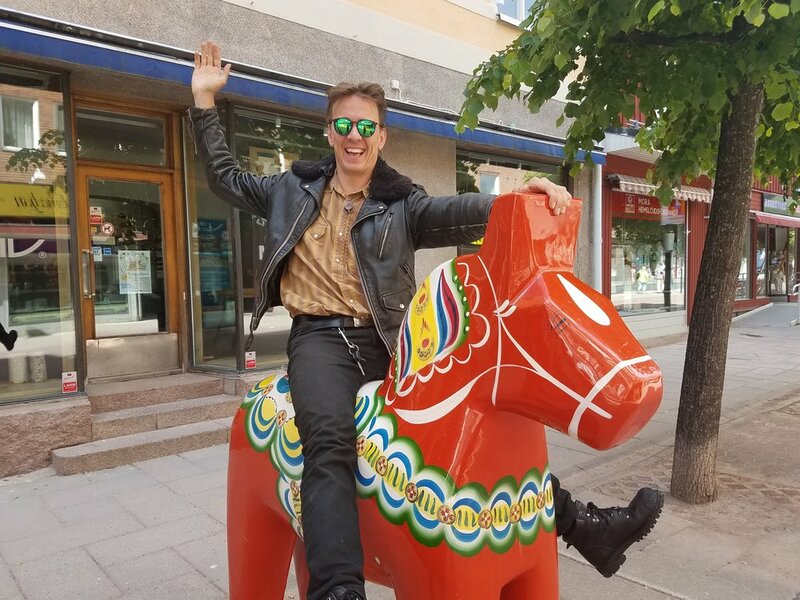 Davey's first dalahäst in the wild! Enjoying a roadside fika near a grass roofed stuga.